Sometimes the older you get—or the longer you've been with someone—you start to think things like Valentine’s Day are silly. And they are a little silly, and yes, it’s a way for candy and flower stores to get our money. I feel like we need to take any opportunity to carve out those moments for just the two of us, to reconnect and take a second to say “I love you." Of course we could just do this any day of the week or month, but let’s face it, we usually don’t. So I don’t mind being “forced” a little into making an effort. I’m not saying we have to book a super fancy dinner or a trip out of town. I’m just talking about turning the TV off, making a nice meal (like this crazy beautiful pink pasta! ), and taking the time to remind ourselves just how lucky we are to be sitting across the table from that other person. This pasta is easy, but elegant. It’s a little indulgent with hints of brown butter. Place a large pot of water over high heat for cooking the pasta. While the water is heating, prepare the beet water you will use later by combining the beets and water in a blender. Transfer the beet water to another large pot. Begin heating the pot holding the beet water over high heat. 2. When the first pot of salted water has reached a boil, add the pasta and cook it according to the package directions until it is about 2-3 minutes shy of being done. Then drain the pasta and place it in the now-boiling beet water. Continue cooking it until it is al dente—2-3 minutes more. Drain the pasta and rinse it off to get rid of any beet pulp stuck to the noodles. 3. While the pasta is cooking, prepare the lemon ricotta garnish by thoroughly mixing the ricotta cheese and lemon zest. Set this mixture aside for later. 4. 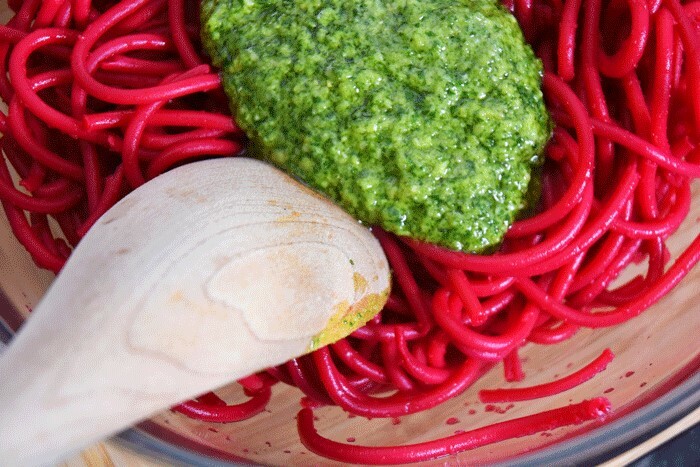 After the pasta is done, drain it and toss it with the Brown Butter Arugula Pesto. Serve garnished with the lemon ricotta mixture, pine nuts and arugula.